After months of preparation, Guard-All Building Solutions is proud to announce that the company is now ISO 9001:2015 Certified. ISO 9001 is a standard that sets requirements for a quality management system. Organizations use the standard to demonstrate the ability to consistently provide products and services that meet customer and regulatory requirements. “We have been working diligently preparing for our external ISO audit. Pfeifer has a group certification so all 28 of their companies must meet the ISO requirements for any of us to be certified. The companies are audited on a rotational basis,” said HR Director Steve Pandukht. The ISO 9001 standard is based on several quality management principles including a strong customer focus, the motivation, and implication of top management, the process approach, and continual improvement. Using ISO 9001:2015 benefits both the business by optimization operations and the customer by ensuring they get consistent, good quality products and services. 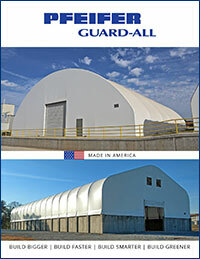 “Guard-All passed their ISO audits with no deviations! This is a huge accomplishment. There were some recommendations which we will implement. We also will be taking steps to further implement the processes,” said Pandukht. ISO (International Organization for Standardization) was established in Geneva, Switzerland in 1947 to develop international standards to help ensure that supplies, materials, products, processes, services, systems, tools, equipment, and personnel are working safely and effectively. Conformity assessment guides were developed to help ensure organizations applied the standards.